George attempts to cover up why Elaine cannot babysit for Vivian’s kid anymore. George first mentions that Elaine is going to live with her grandparents in Redding Pennsylvania. When Vivian doesn’t believe him he confesses that he was covering and that Elaine has actually been deported back to Scotland. The lies continue… Elaine has been chosen to represent the Upper West Side in the next Biosphere project. George wouldn’t expect Vivian to know about this, since it’s underwater. But, it’s all for charity, so what’s the difference. George and Vivian connect over their love of pastrami, which is of course the most sensual of all the salted cured meats. Vivian: Elaine, I’m so glad you came out. Vivian: You haven’t seen Jimmy for years. Elaine: I know, I’m glad I got to see him before he hit puberty and got, you know all lurchy and awkward. Vivian: Actually, I’m gonna need someone to look after him tomorrow evening. Vivian: Do you know anyone responsible? Elaine: Do I know anyone?? Vivian: Well, if you think of anybody, give me a call. Vivian: Hey, Elaine! How did it go? Vivian: Really? Some sitter have told me he’s bit of a handful. Elaine: Oh, handful of sunshine. I wish I could do this every day. Vivian: Oh Elaine, that’s so good to hear. I’ve been having a few health problems lately. Elaine: It’s not serious, is it? Vivian: Well, it might be. Just in case anything does happen, it’s nice to know there’s somebody like you around. Elaine: Oh yeah, that eh…that is nice to know. Elaine: Oh, hi, oh God. I didn’t here you come in. Elaine: I don’t know, I don’t know…we had HoHos for dinner and then eh…and then he put this plastic bag over his head and started running around until he got tired and then he laid down somewhere I…I tell you I’m no good watching that kid. Vivian: Sleeping like an angel. Elaine, you’re the best. Elaine: No! I’m a scatter brain. That’s why I probably can’t hold a job or keep a man! Vivian: Be quiet. So, will you watch Jimmy tomorrow? Elaine: All right, but I’m running out of purses here. Elaine: Hi! This is my friend George. Elaine: I’m gonna go say hi to Jimmy. Elaine whispers to George: You’re up. Vivian: Oh, isn’t Elaine fantastic? George: Yes she is. It’s a pity we won’t be seeing much more of her. George: Oh, you haven’t heard, she’s going to live with her grandparents in Redding Pennsylvania. Vivian: Her grandparent passed away five years ago. George: Yes they did. I was covering. Elaine has been deported back to Scotland. Vivian: She’s American citizen, I have seen her passport. George: All right, no more lies. Elaine is been chosen to represent the Upper West Side in the next Biosphere project. Vivian: I haven’t heard anything about another Biosphere. George: That’s because it’s underwater. 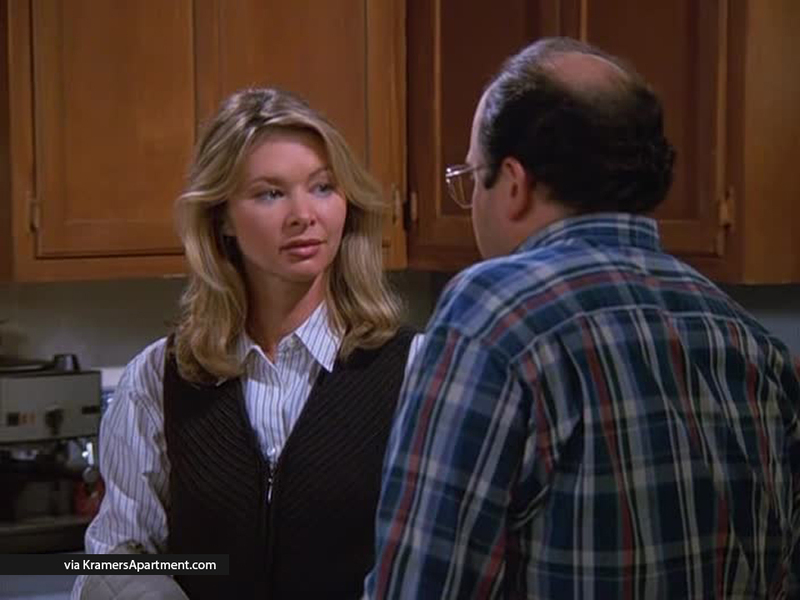 George: Well, it’s all for charity, so what’s the difference. George: Well, I’m also an architect. Is that pastrami? Vivian: Yes it is. I find the pastrami to be the most sensual of all the salted cured meats. Hungry?